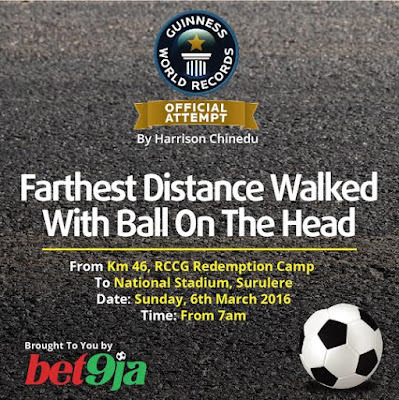 Nigerian footballer based in Cambodia, Harrison Chinedu, has broken the Guinness World Record for the farthest distance traveled while balancing a football on his head and cover a distance of over 45. 64km reports afriwap.com. The record was set in 2014 as Indian soldier NaibSubedar Azad Singh traveled a distance of 45.64km. President of the Foundation, Dr. Rafiu Ladipo, who doubles as President of Nigeria Football Supporters Club, recalled that the foundation received less support at inception of the event. Congrats Chinedu Harrison for making Nigerians proud.